Custom person fields can be attached to any person in Populi. You manage them on the Profile > Info view. They're created in Admin > Manage Custom Info (see below). 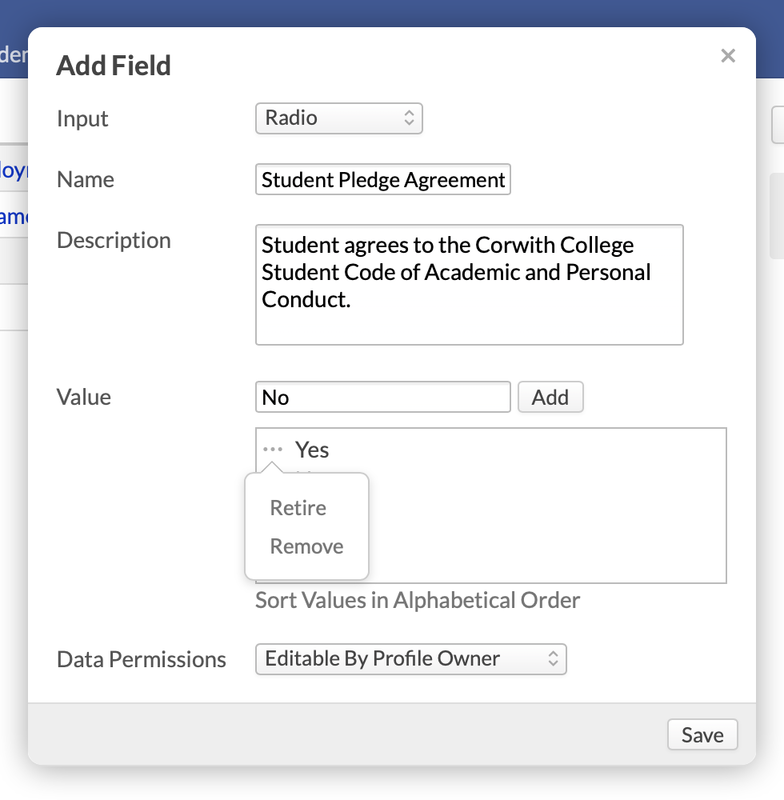 Student fields can be attached to active students in the Student Info panel in the Profile > Student view. They're created in Academics > Settings. Admissions fields can be attached to leads. These fields are managed for individual leads on Profile > Admissions under Lead Info. You can also use application fields to collect data for these fields by using the link to existing field option (for that matter, you can use that option to fill in custom person and student fields, too). They're created in Admissions > Settings. Organization fields are—you guessed it!—added to organizations. You can even add custom fields for donations in Financial > Donations > Settings. Person, student, and admissions fields are available in most XLS exports and, if attached to a student, the Data Slicer. Whatever you do, don't add custom fields that duplicate information that Populi already tracks! This results in duplicate, inconsistent, and/or missing information. Only create a custom field once you're sure that Populi's built-in fields can't store the information you need! Here's how to create a new custom person field. The same instructions apply for the other custom field types, save for step 1. Go to Admin > Manage Custom Info (under the People heading). File/Multiple Files: Creates a custom file upload space. Choose whether to allow one file upload or several. Give the field a name and description. These will both be visible when anyone updates this field. Choose the permissions for this field. Anyone with the Staff role can see and edit a person field. You can also make it visible and/or editable by the profile owner (the person represented on the profile). You can edit it by clicking the field name in the list. And, of course, you can start recording it for people on their profiles.